Amosu is known for stepping it up another notch when it comes to tricking out everyday items. You might remember a while back, when we posted the diamond encrusted Lamborghini keys by Amosu. Now Amosu is claiming to have the World’s Most Expensive Blackberry. 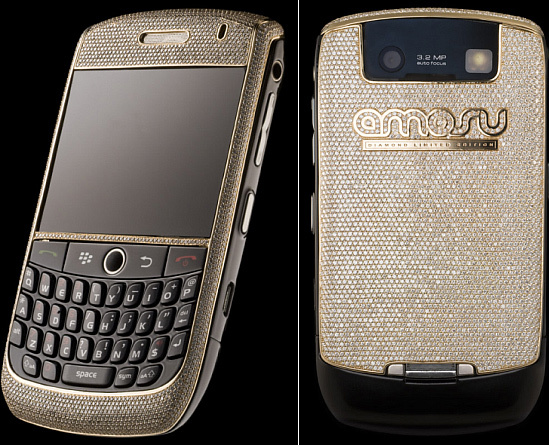 The handset is a BlackBerry Curve 8900 encrusted with 4,459 diamonds and coated in 18 carat yellow gold. Amosu will give you the option of customizing the blackberry with your name or company logo. It’s also the first Blackberry to come with a 24-hour global concierge service. Only three of these diamond encrusted Blackberry 8900 will be made and will run $240,000. One has already been sold to a client in the Middle East.